The last spot I did was the metridium fields. Metridiums are huge white anemones that look really ethereal and peaceful. To get to them I would follow an old pipe line that was linked to the canning factories that are now the Backscatter shop. Becca told me that the metridiums are a little hard to find once you reach the end of the pipe so I didn’t have my hopes up and was just there to explore. Heading along the pipe I saw ton of nudibranchs and bat stars, but above me there were increasingly thick clouds of sea nettle jellies. 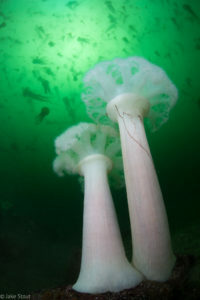 When I reached the end of the pipe I decided to just photograph the sea nettles because they’re so cool, and I probably wasn’t even going to be able to find the metridiums. So I started photographing the sea nettles floating along with them, then all of a sudden I looked down and saw the metridiums! I swam down to them and started photographing. I got some pretty good shots. I ascended a few feet to swim over and photograph more. It was then a sea nettle sting me across my lips. It wasn’t bad bad sting or anything just was shocking and hurt a little. 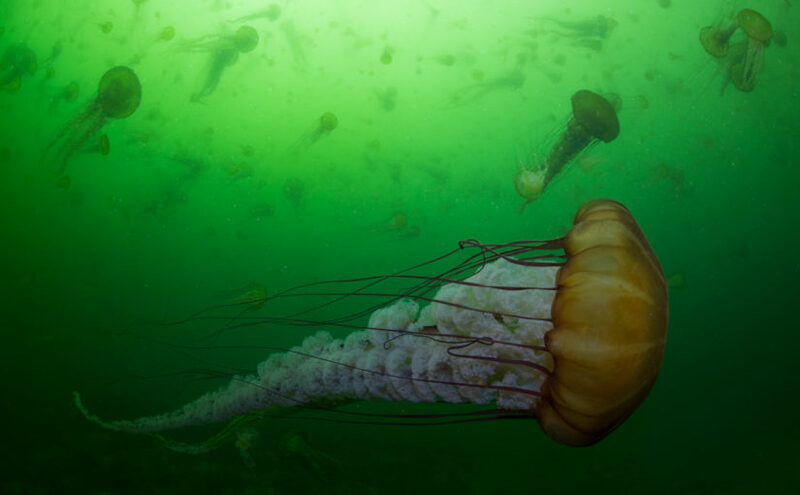 Then I had a realization I had to surface through the cloud of millions of sea nettles. I was down about 50 FSW and started my accent. The safety stop was really fun as I tried to avoid their tentacles. I looked down and saw about forty or fifty of them flying in all directions as they were kicked by my fins. It was a great dive. Now I just had to recreate the photos I had got for the competition so I again went along the pipe found the metridiums and started shooting. 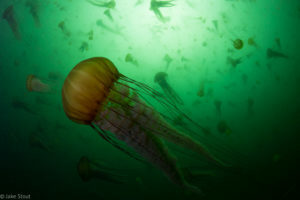 I got even better shots than before, and there were even more sea nettles, they were all different sizes. Some as small as my hand and some longer than me, all swimming in different directions. At one point I stopped photographing and just looked at the scene before me in awe. The millions of sea nettles moved so rhythmically that it was really calming to just sit there in total peace. That is until I got stung again and begun my ascent. It is by far one of my favorite dives to date.